Ashton-under-Lyne Junction is a major waterways place minor waterways place place on the waterways major waterways place village town city at the junction of the Huddersfield Narrow Canal with the Ashton Canal. 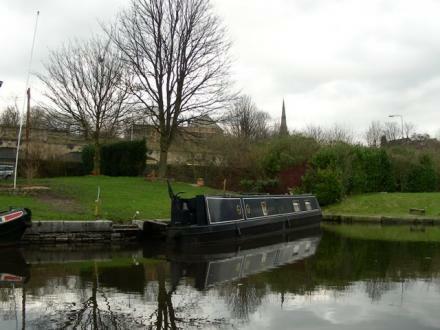 Royal George Aqueduct is on the Huddersfield Narrow Canal, 7 miles and 6¼ furlongs and 17 locks to the northeast. Dukinfield Junction (Junction of Ashton Canal with the Peak Forest Canal) is on the Ashton Canal, 4 furlongs to the west. The nearest place in the direction of Royal George Aqueduct is Whitelands Bridge No 111; ¼ furlongs away. The nearest place in the direction of Dukinfield Junction is Ashton-under-Lyne Railway Viaduct No 32; 1 furlong away. 160 Katherine Street, Ashton-under-Lyne — 632 yards to the northwest. Fold Way, Ashton-under-Lyne, OL7 0PG — 1567 yards to the west. 4 Old Cross St, Ashton-under-Lyne, OL6 6HA — 430 yards to the north. Ashton — 1558 yards to the north. 7 Stamford square, Ashton-under-Lyne, OL6 6QU — 1159 yards to the east. 79 Stamford Park Rd, Stamford, 79355 — 1564 yards to the east. Cavendish Mill, Ashton-under-Lyne, OL6 7DN — 953 yards to the northwest. Unit 2 Lower Wharf Street, Ashton, OL6 7PE — 102 yards to the northwest. Willow Wood Hospice, Ashton-under-Lyne, OL6 6SL — 1368 yards to the east. Tameside College, Beaufort Road, Ashton-under-Lyne, OL6 6NX — 729 yards to the northeast. 7 Lower Wharf Street, Ashton-under-Lyne, OL6 7PE — 79 yards to the north. 112 king street dukinfield cheshire sk16 4ld, Dukinfield, SK164 — 945 yards to the south. Wellington Rd, Ashton-Under-Lyne, Tameside, Manchester, Manchester, OL6 7TE — 858 yards to the northwest. 9-11 Wellington Road, Ashton, OL6 6DA — 549 yards to the north. Greenside House, Richmond Street, Ashton-under-Lyne, Ashton-under-Lyne, OL6 7ES — 1323 yards to the west. Ashton-under-Lyne — 1350 yards to the northwest. Manchester — 1353 yards to the south. Wellington Rd, Ashton-under-Lyne, OL6 6 — 755 yards to the northwest. Ashton Leisure Park, Fold Way, Ashton-under-Lyne, OL7 0BG — 1605 yards to the west. 141 Katherine Street, Ashton-under-Lyne, OL6 7AW — 642 yards to the northwest. Ashton Leisure Park, Fold Way, Ashton-under-Lyne, OL7 0PG — 1590 yards to the west. Ashton-under-Lyne — 492 yards to the north. Dukinfield — 1159 yards to the south. canterburry street, Ashton-under-Lyne, OL6 6HY — 915 yards to the north. Pamir Drive, Ashton-under-Lyne, OL7 0LY — 1623 yards to the west. Unit 1, Vale Trading Estate, Furnace Street, Dukinfield, SK16 4JA — 261 yards to the southwest. Bayley Street, Stalybridge, SK15 1PZ — 1558 yards to the east. Furnace Street, Dukinfield, SK16 4JA — 261 yards to the southwest. Ashton Leisure Park, Ashton-under-Lyne, OL7 0PG — 1580 yards to the west. Ashton-under-Lyne — 1475 yards to the southwest. 1B Warrington Street, Ashton-under-Lyne, OL6 6XB — 281 yards to the northwest. Fountain Street, Ashton-under-Lyne, OL6 9 — 1622 yards to the northeast. Manchester — 1205 yards to the east. Water Street, Ashton-under-Lyne, OL6 7AN — 704 yards to the northwest. St. Peter's, Ashton-under-Lyne — 1148 yards to the west. Quest Media Centre, Quest Media Network Ltd, Off Bank Street Rear of Cavendish Mill, Ashton-under-Lyne, OL6 7DN — 569 yards to the west. Manchester — 1592 yards to the east. Manchester — 630 yards to the southeast. 193 Old St, Ashton-under-Lyne, OL6 7SR — 636 yards to the west. Ashton Leisure Park, Fold Way, Manchester, OL7 0PG — 1550 yards to the west. Ashton Under Lyne, Manchester — 1518 yards to the west. Cineworld Ashton, Fold Way, Ashton-under-Lyne, OL7 0PG — 1532 yards to the west. Darnton Road, Manchester, OL6 6 — 1372 yards to the northeast. Park Parade, Ashton-under-Lyne, SK16 — 778 yards to the southwest. Unit 2B, Ashton Retail Park, Wellington Road, Ashton-under-Lyne, OL6 6 — 840 yards to the northwest.